Lane’s best leather Conditioner, a rich creamy preservative, beautifies, softens and protects all car leather surfaces, guaranteed! Now, you can be assured no matter how much wear and tear your auto leather seats encounter you will have the ultimate protection. Whether you have a new or used car, conditioning your leather seats is easy with Lane’s auto leather conditioner. You set out to buy the new car. Leather seats are a must. After hours of searching, you find the leather interior that fits your style. Not only do you feel the leather, you smell it, reassuring yourself this is exactly what you want. After all, you will spend a lot of time in your car. People do not realize the wear and tear they put on leather. Over time car leather seats become dry, and eventually start to crack. When this happens it’s too late. Preventive care by using Lane’s best auto leather conditioner will prolong the look, feel and desired leather smell. Directions: First clean your leather with Lane’s Leather Cleaner. 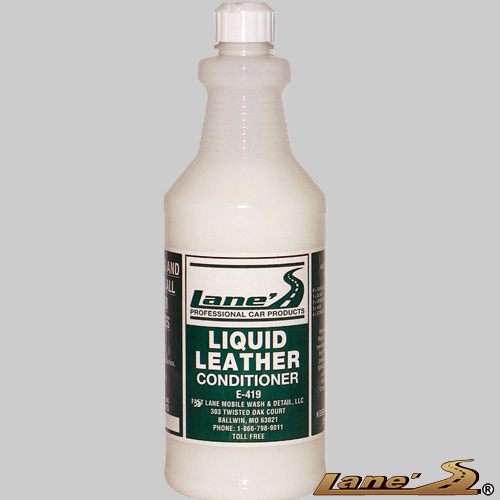 Apply Lane’s Liquid Leather Conditioner with a clean, dry cloth and allow to dry. Click here for more products like our Best Leather Conditioner!